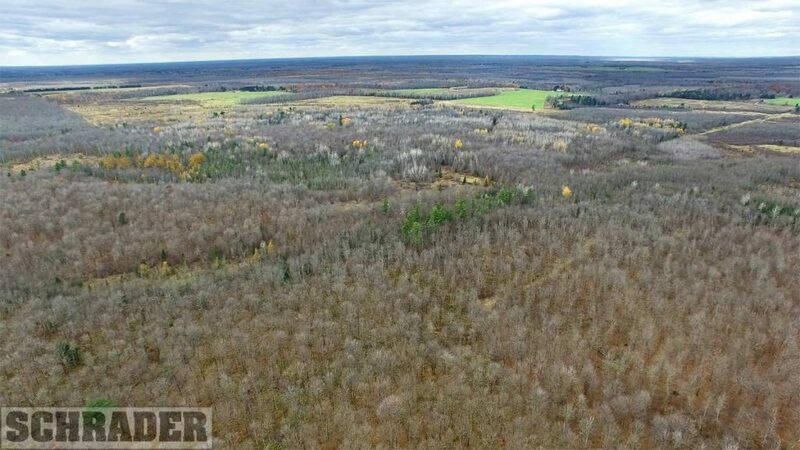 MEDFORD, Wisconsin (August 21, 2017) — Approximately 1,428 acres of Wisconsin land — including a home, recreational land, pasture and tillable land — will be offered at auction Wednesday, Sept. 20, with Schrader Real Estate and Auction Company marketing the property and conducting the auction. The land, located in Price County, northwest of Eau Claire, will be offered in 10 tracts, including the two-story country home on 2.5 acres. The land tracts range in size from 68 acres to 319.5 acres. Bidders may bid on any combination of tracts or the entire property. “The home has a full-service bar with a walk-in cooler, a large dining room, and a full finished basement with recreation area and dormitory style sleeping quarters. It would be excellent either as a private home or a corporate hunting retreat,” said Gary Bailey, with Schrader. The largest land tract, 319.5 acres, has a heated shop with equipment storage, with seven overhead doors. Schrader personnel will be available at the property to accommodate inspections on Aug. 25 and 26, as well as Sept. 9, 10 and 19. Individuals seeking additional information may visit www.schraderauction.com or call for details. The auction will begin at 6 p.m. Wednesday, Sept. 20, at the Simek Recreation Center, 1037 West Broadway Avenue, Medford.